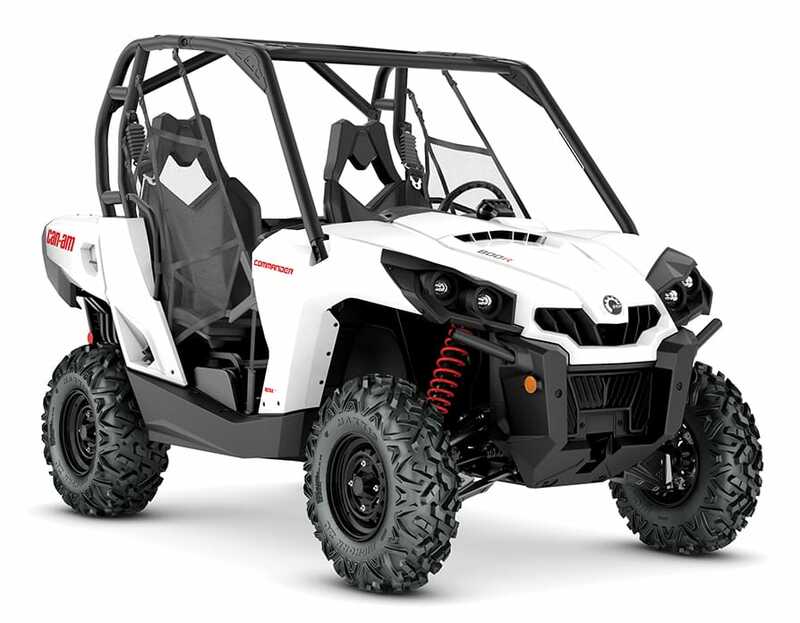 The original Yamaha Rhino 660 started the UTV revolution and evolution, and we highlighted the top 55 sport UTVs last month. 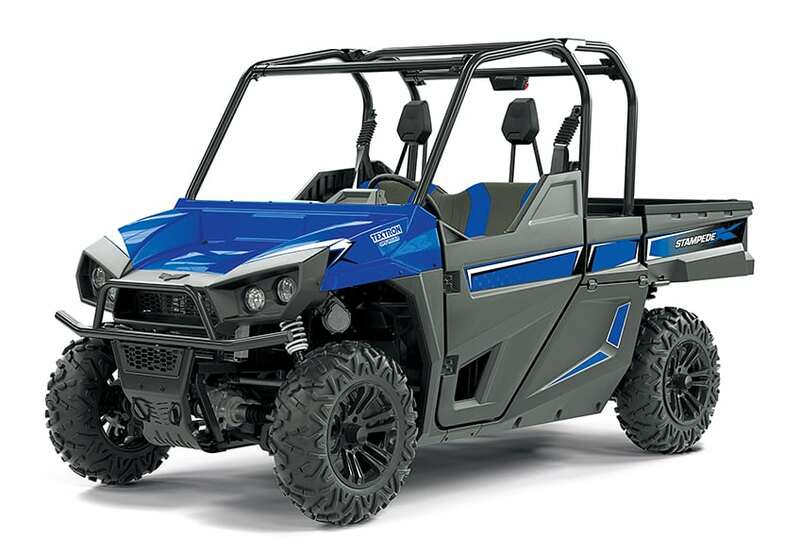 The thing is, that Rhino wouldn’t have even qualified for the 2018 sport UTV category, and it would barely make this recreation utility buyer’s guide with a top speed of 40-plus mph. 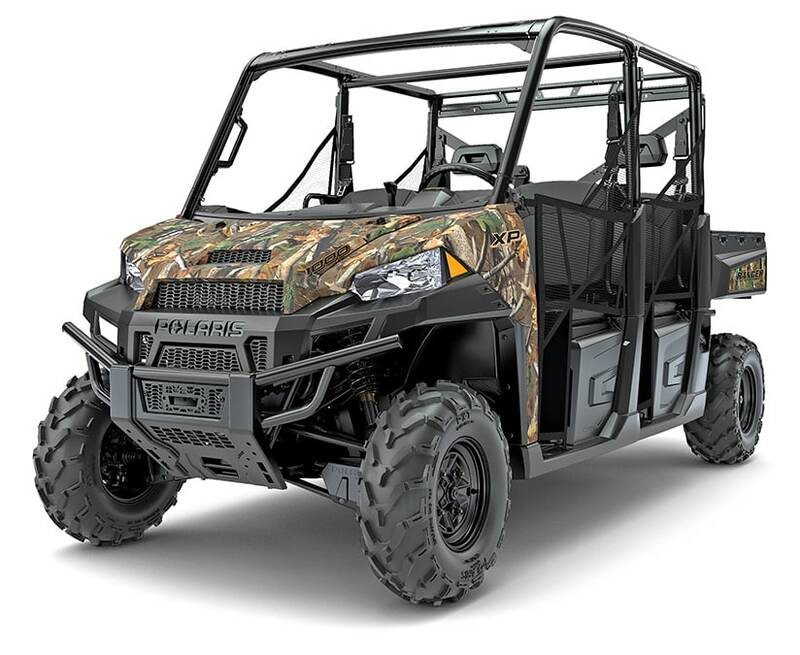 While recreation UTVs have a dump bed and most sport bench seats for utility use, these 54 offerings have enough top speed (45–55-plus mph) and overall performance to be fun for exploring, trail riding, hunting, fishing and/or whatever your adventure may be. 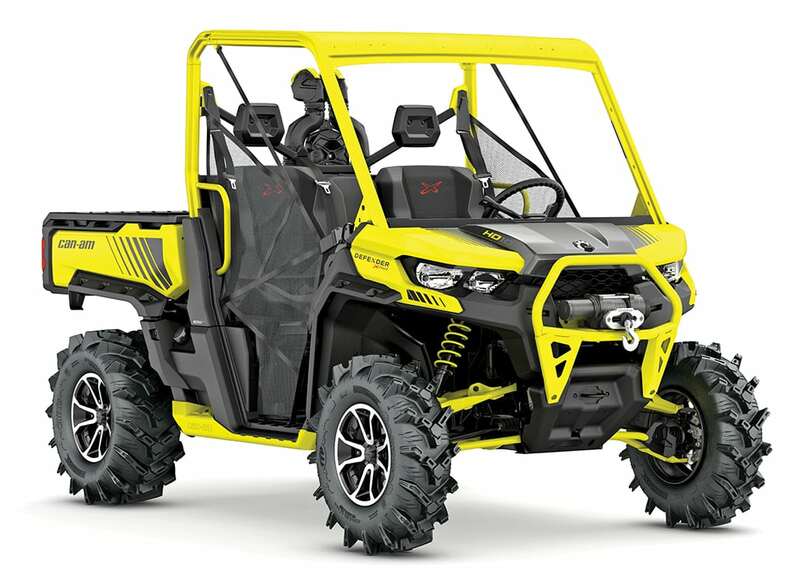 For 2018 Can-Am introduces a new Defender HD10 X mr and Max HD10 Lone Star Edition, Polaris completely reworked the Ranger XP 1000 and offers two Special Editions (and two Crew XP 1000 SEs), while Honda offers a Limited Edition Pioneer 1000 and 1000-5. 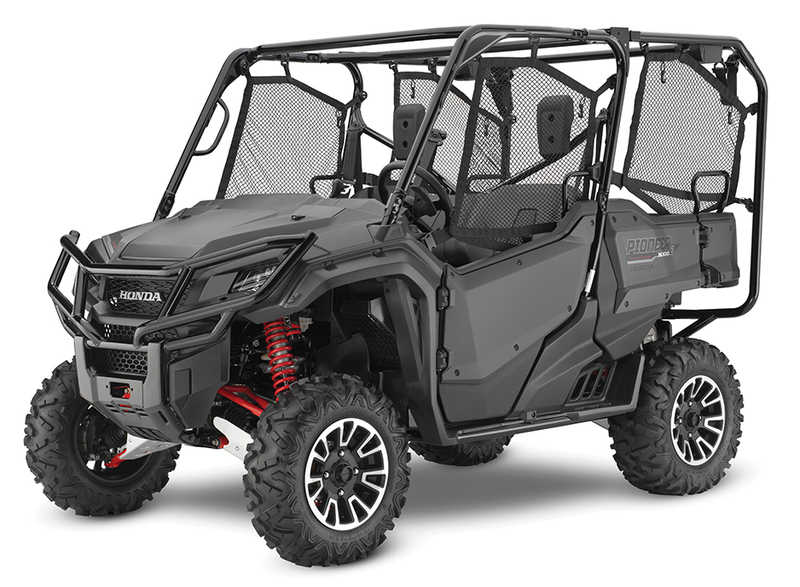 Yamaha adds Ranch Edition Vikings and Viking VIs to its Special Edition lineup, while Kawasaki introduces the all-new sporty Mule Pro-FXR and Ranch Edition Pro-FX and Pro-FXT. Kymco gives the UXV700i a huge makeover and offers new LE Prime and LE Hunter Editions. 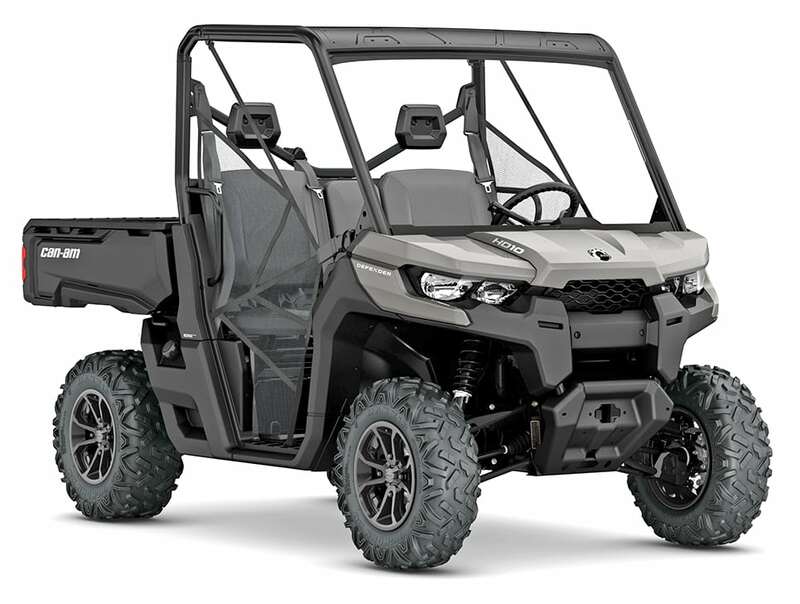 Commanders have an 85-HP V-twin, CVT with EBS, Visco-Lok QE front diff, Tri-Mode EPS, dual torsion bars, HPG shocks for 10 inches of travel with dual-A-arm front and trailing-arm rear suspension. Brakes are 220mm front and 214mm rear discs with twin-puck calipers. XTs upgrade to a 4500-pound winch, front bumper, bed rails and mudguards. 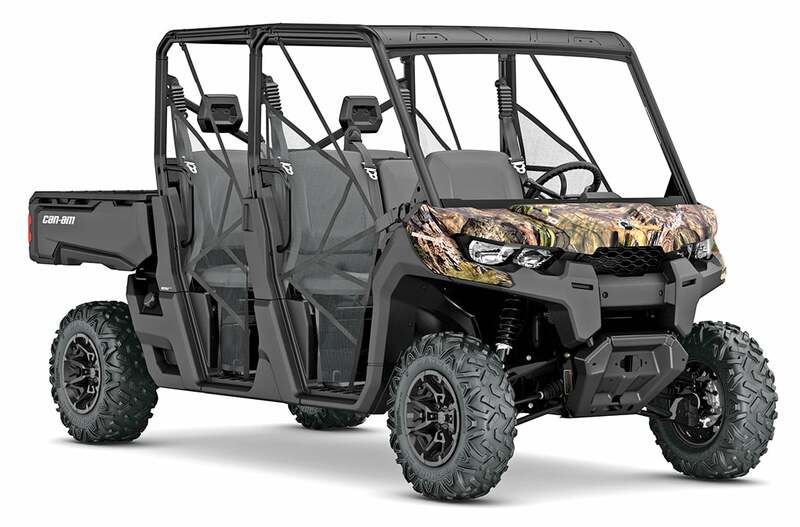 All Commanders retain the two-level locking bed, and the LTD gets the XT package, plus Bluetooth audio system with four speakers, Garmin Montana 650T touchscreen GPS, premium roof, half windshield, and new Fox Podium QS3 shocks. 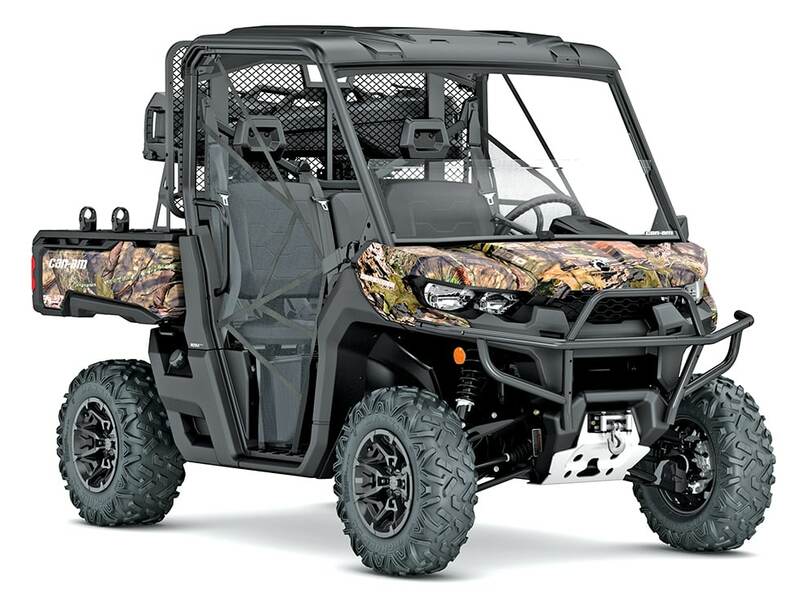 The Hunting Edition gets LTD package, minus the audio and GPS, plus dual Kolpin 6.0 gun boots, an Xtreme front bumper and aluminum skid plate. Defenders sport lots (10.4 gallons) of storage, including an in-dash removable tool tray and 8 more gallons under the dash. The 976cc V-twin makes 72 HP and has three drive modes—eco, normal and work—plus, for final-drive modes, from Turf Saver to locked 4WD. 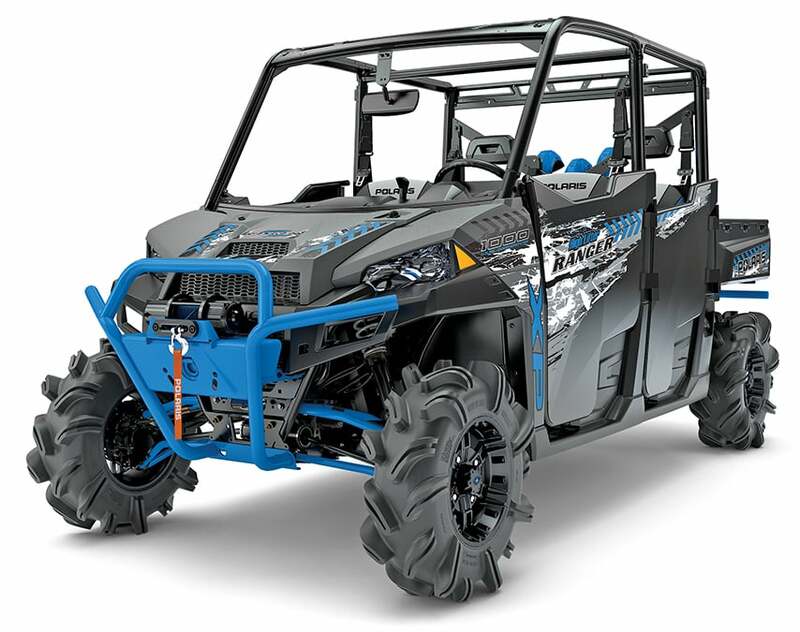 The Pro-Torq transmission has a Quick-Response System with four-wheel EBS. Claimed dry weight 1,404 lb., DPS 1,414 lb. Defenders have Tri-Mode EPS, 83-inch WB, 67-inch width, unlocking diffs and 27-inch Bighorn 2.0s on 14-inch wheels for crisp handling. The XT package adds a 4500-pound winch, front bumper, skid plate and roof, and the XT-P adds Fox 2.0 Podium shocks. XT Cabs have an enclosed cab with glass windshield, wiper and washer kit, doors with electric windows, sliding rear window and integrated heater. Claimed dry weight XT 1,550 lb., XT Cab 1,844 lb. The 976cc V-twin makes 72 HP and has three drive modes, plus four final-drive modes from Turf Saver to locked 4WD. 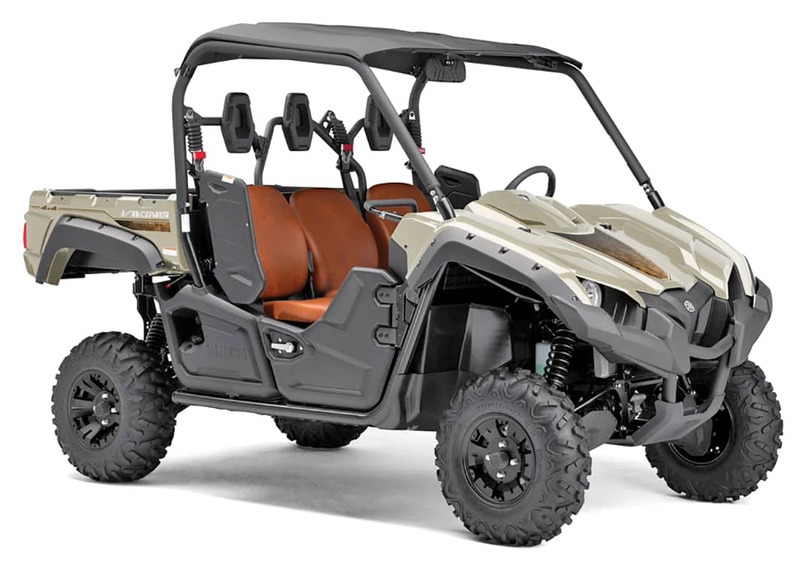 Defenders sport Tri-Mode EPS and 27-inch Bighorn 2.0s on 14-inch wheels, 16.2 gallons of storage, and Pro-Torq CVT. 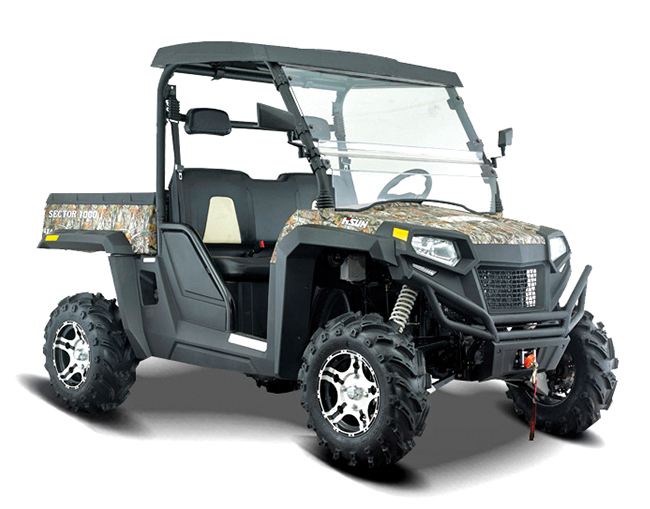 The Hunting Edition has MOBUC Camo, dual Kolpin Stronghold gun boots, Lin-Q headache rack, mirror and LED spotlight. Claimed dry weight 1,658 lb. The 976cc V-twin puts 72 HP to the ground via Can-Am’s Pro-Torq transmission, new Smart-Lok fully locking front diff and 30-inch ITP Cryptid mud tires. The X mr also sports XT package, plus double-arched A-arm suspension, aluminum rock sliders, and snorkels for the engine and CVT. 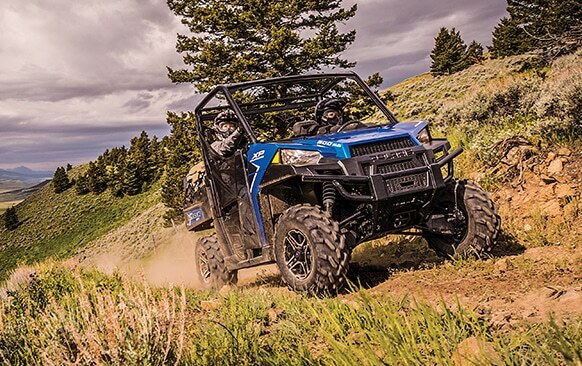 Smart-Lok also has two modes—Trail and Mud—for optimum handling. Claimed dry weight 1,550 lb. Sectors sport a 976cc V-twin with 91mm pistons, 75mm stroke and 11.0:1 compression with Delphi EFI and CVTech Trailbloc IBC CVT. 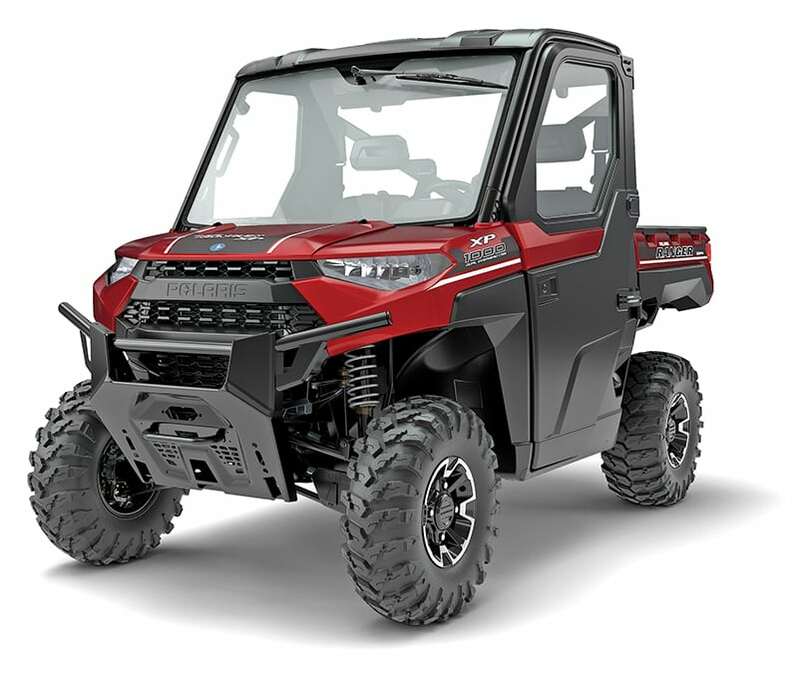 Sectors sport a hard roof, split windshield, 3,500-pound winch, H-D bumper, LED lights, side mirrors and a power dump bed. Wheelbase is 85 inches, and they’re CARB/EPA-legal. 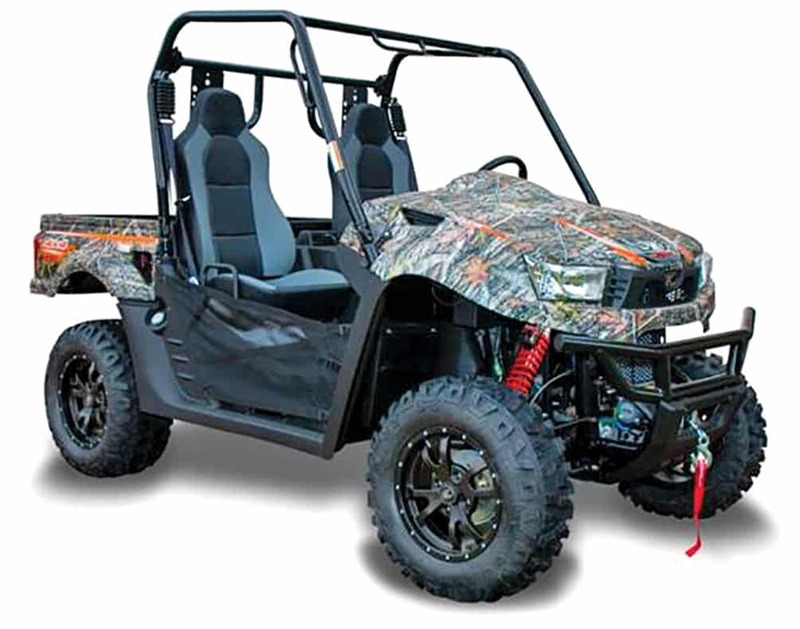 Hisun also covers Sectors with a two-year warranty. Claimed dry weight 1,620 lb. Bed capacity 1,000 lb., CA 600 lb. Claimed curb weight 1,526 lb. 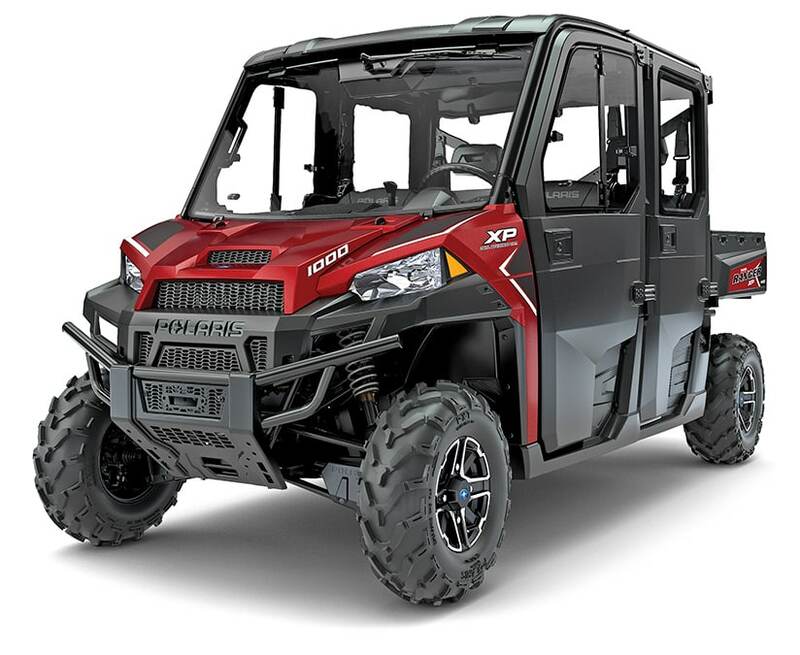 New for 2017, the XP 1000 got a complete makeover for 2018, gaining 2.5 inches of width, larger tires, more travel (11 inches), more towing and fuel capacity (11.5 gallons) and five color choices. 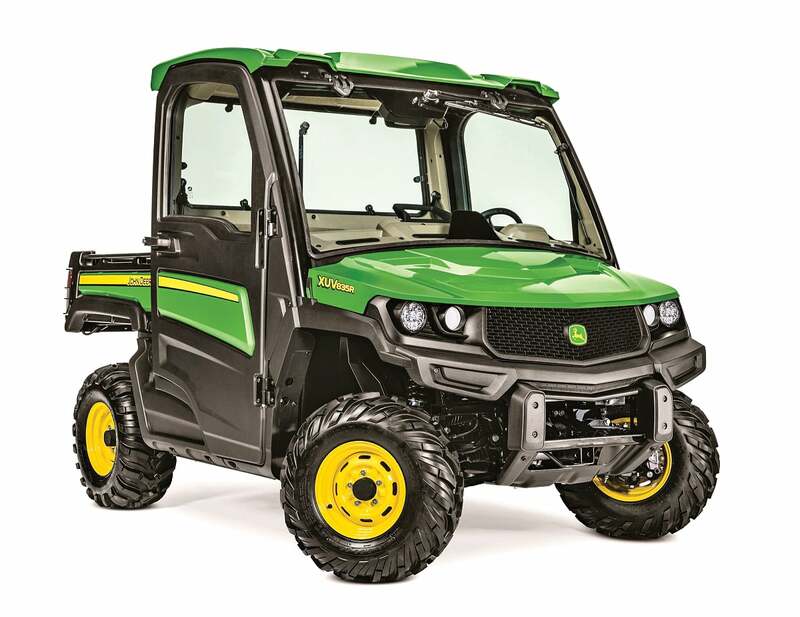 The 82-HP ProStar EFI twin makes 61 pound-foot of torque, and the XP 1000 comes only with EPS and in four special editions, all with a Versa-Trak unlocking rear diff, EBS and On-Demand AWD front diff. 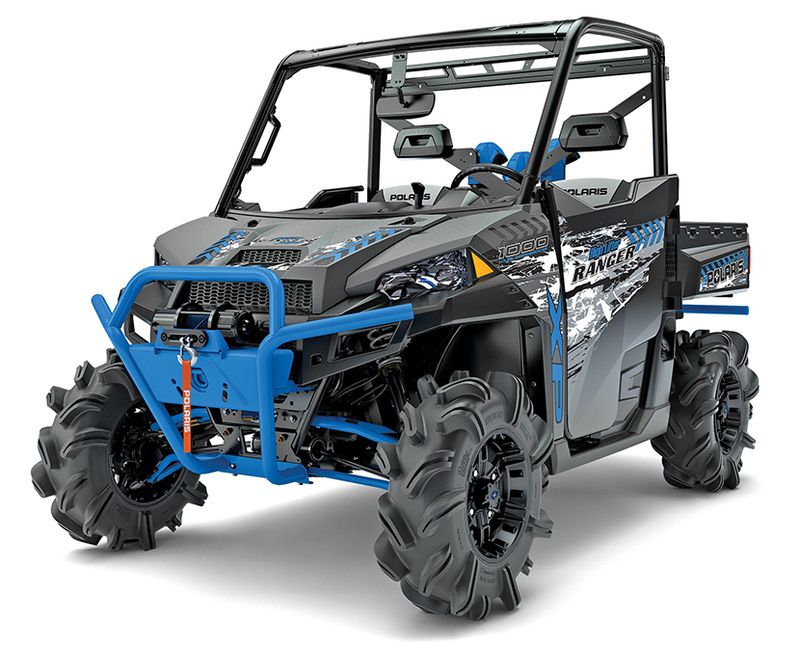 The High Lifter Edition XP 1000 gets the RZR’s heavy-duty reverse chain, lower gearing and H-D half shafts to turn the 28-inch Outlaw 2 mud tires. 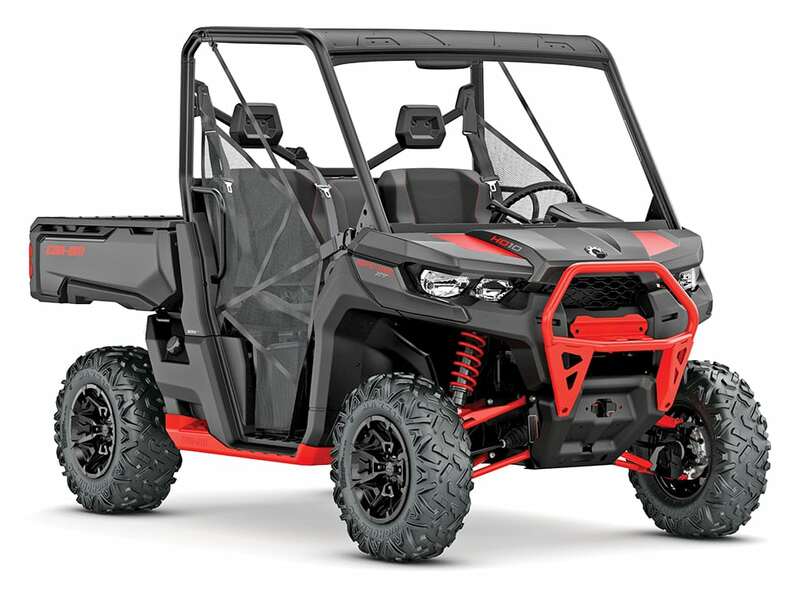 This mud machine also gets H-D bumpers and shock springs, a 4,500-pound Pro winch, High Lifter high-clearance lower A-arms, a rear-view mirror and headrest-level snorkels for the engine and CVT ducts. The HLSE’s wheelbase is 83 inches. 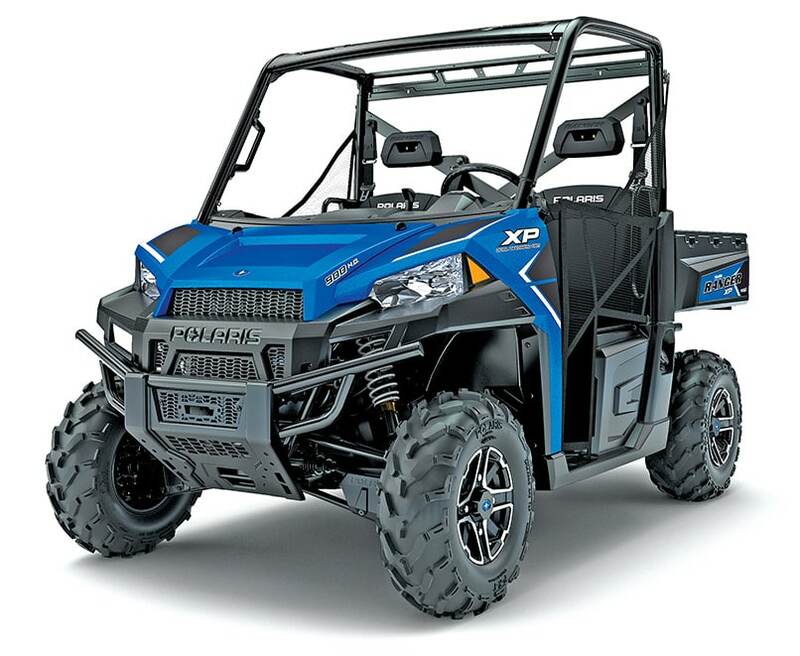 New, the 82-HP XP 1000 twin has twin-piston front and rear brake calipers for fast stops. The Northstar sports a premium Pro-Shield cabin, fixed windshield with wiper, rear glass panel, dome light, rear-view mirror, Cut & Sew seats and HVAC heater and air conditioner. 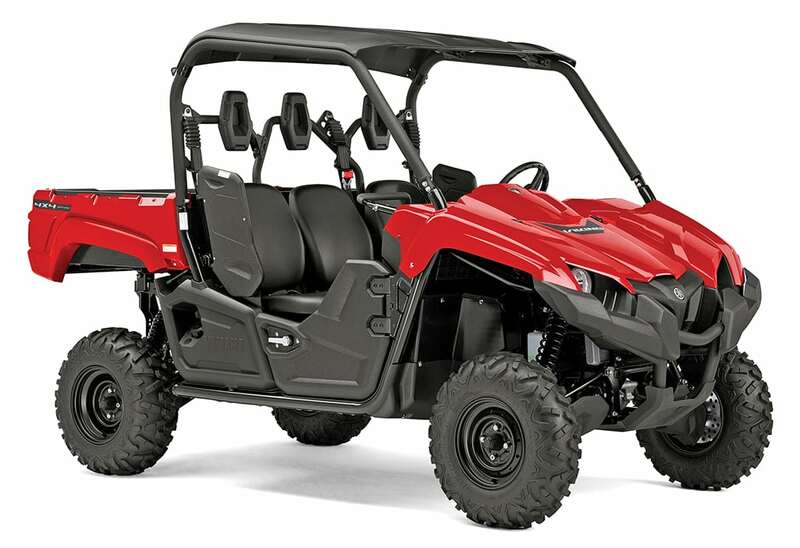 XP 1000s also have dual-sweep analog dials and four-inch LCD Rider Information Center with user-selectable red/blue back lighting. 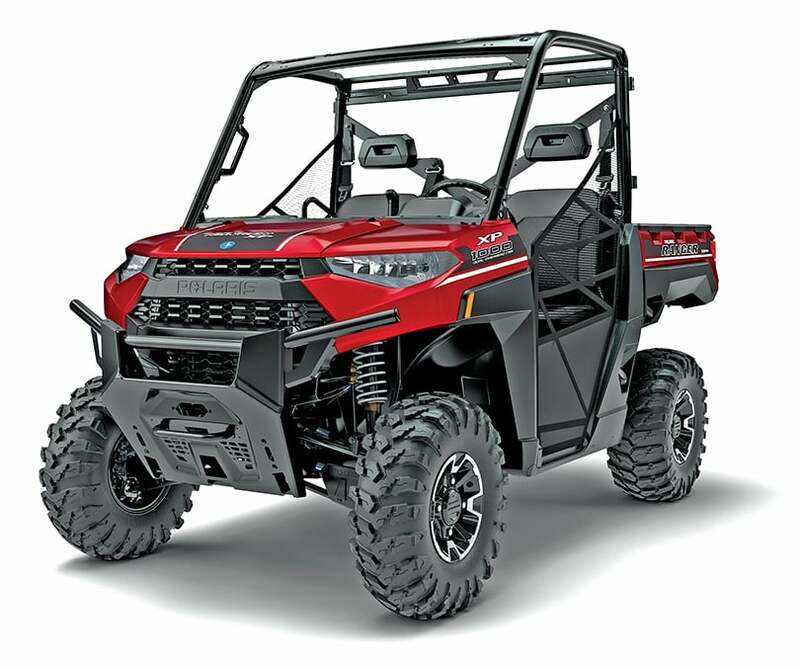 The Stampede sports an 80-HP, 846cc, Webber inline EFI twin and a UTV-first extra-cab design. EPS versions have 26-inch Kenda Performance tires on steel 14-inch rims and an unlocking turf-mode rear diff. Ground clearance is 11.5 inches, and the contoured seat holds two adults. 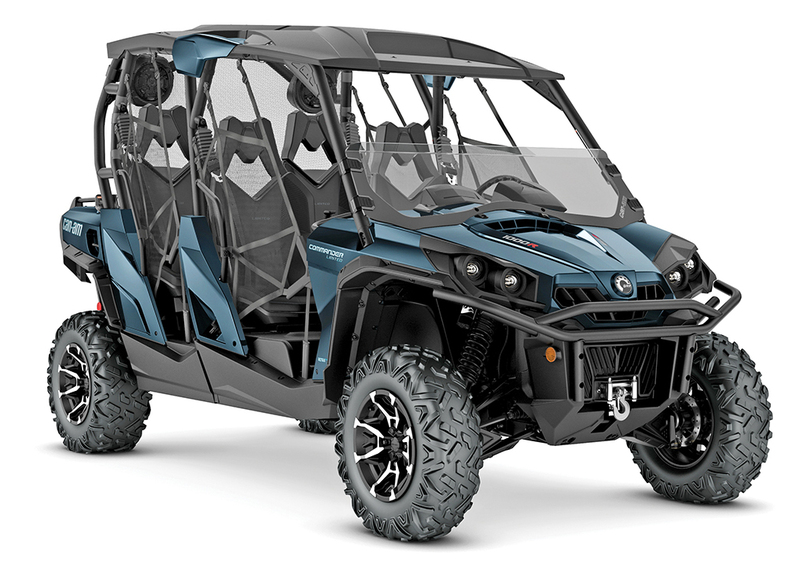 The Stampede X sports an 80-HP inline twin with 59 pound-foot of torque, on-demand 4WD, EPS, four-wheel double-A-arm suspension, dual torsion bars, an extra-cab design with 24 cubic-foot of storage and larger 27-inch Bighorn 2.0 tires on blacked-out 14-inch wheels. 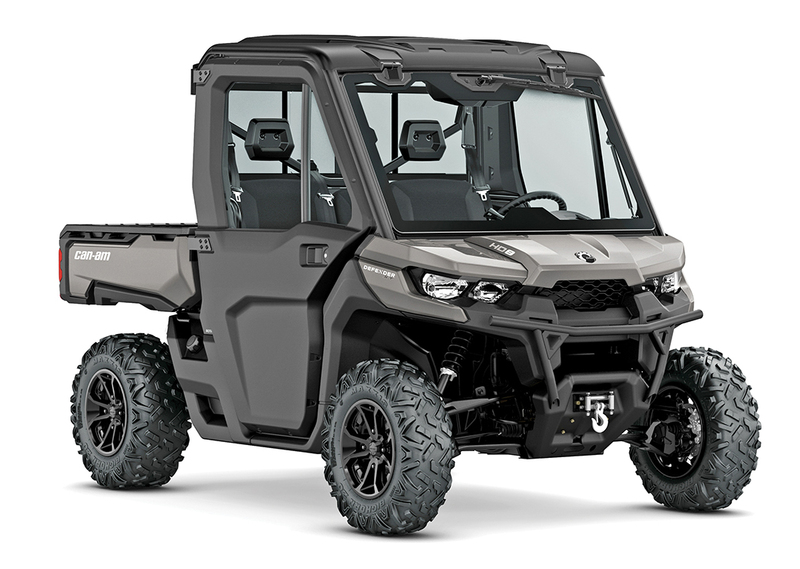 Basically, Textron dropped the non-EPS base model and renamed the EPS+ model the Stampede X.
Ranger XP 900s produce 68 HP and have Versa-Trak unlocking rear diffs in addition to on-demand 4WD. Wheelbase is 81 inches, suspension travel is 10 inches, and four-wheel disc brakes all have two-piston calipers for quick stops. EPS versions get a new Radar Blue color choice. All have a full dash with glove box and 37 liters of under-seat storage, plus a half-ton bed and 1-ton towing. Claimed dry weight 1,324 lb., EPS 1,342 lb. New, the XUV835 sports a 54-HP triple with massive rubber mounts for a smooth ride at 45+ mph. It has a bench seat for three, 84.5-inch WB, a high-strength frame, steel skid plates and boxed front A-arms. It comes in E, M and R trim levels; E is non-EPS, M upgrades to EPS, roof and wiring for accessories, and R adds a fully enclosed cabin with folding windshield, wiper, and doors with electric windows. HVAC/heating is an R option ($22,049). 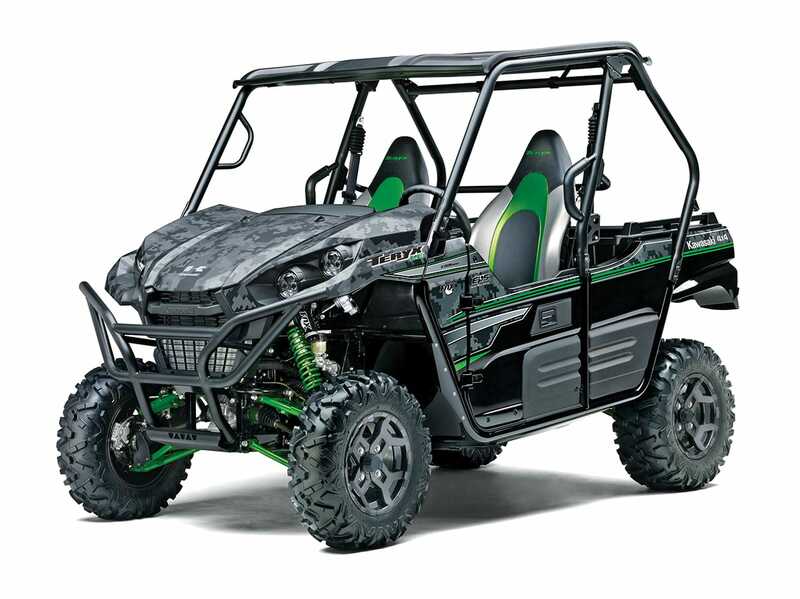 New, the Pro-FXR sports a torquey (48 lb-ft) triple with a 60.8-Amp alternator and durable, CVT for long belt life. Truck-like styling with Halogen/LED headlights, front and rear bumpers, half doors, roof and strong tilt bed let the FXR play as hard as it works. Speed-sensitive EPS, a tilt wheel, a spacious cabin and two-tone bench seat for three add to the fun and comfort. Wheelbase is a sporty 81 inches, and tires are 27-inch Duro Powergrips. 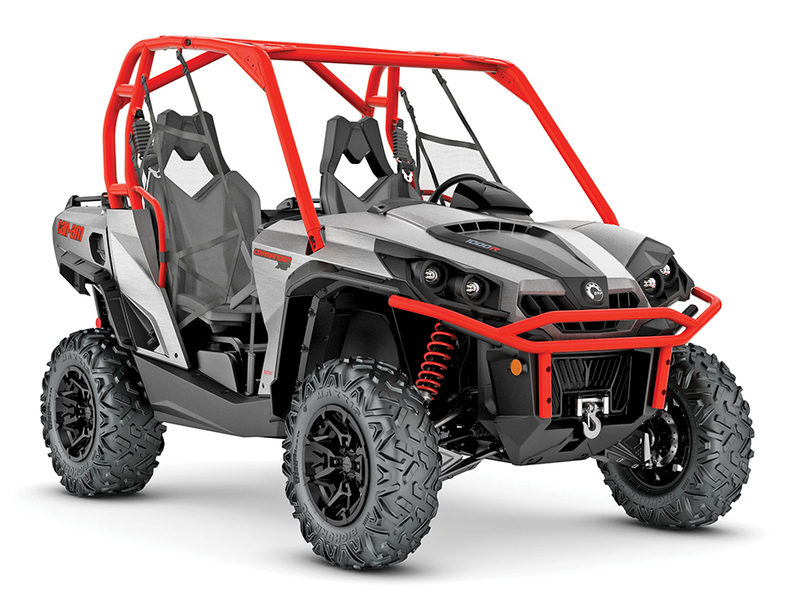 Where the Pro-FXR was designed for off-road recreation, the Pro-FX has a longer 92.3-inch wheelbase, and the 812cc triple is tuned for low-end torque, smoothness and low noise with 26-inch Duro tires. Top speed is a respectable 45 mph in high, and the Pro-FX has 8.7 inches of travel with well-tuned shocks for a sporty ride. Base and EPS models have two halogen headlights and tilt wheel. Claimed curb weight 1,816.9 lb. ; EPS 1,830.2 lb. Pro-FX Mules are tuned for pulling power and conquering hills and have a ladder-type frame. Limited Editions upgrade to Firecracker Red paint, LED inner headlights, six-spoke two-tone aluminum wheels and a roof. Ranch Editions upgrade to automotive-grade Metallic Ti paint and two-tone seats with Ranch badging and Warn Vantage 4000-pound winch with remote. 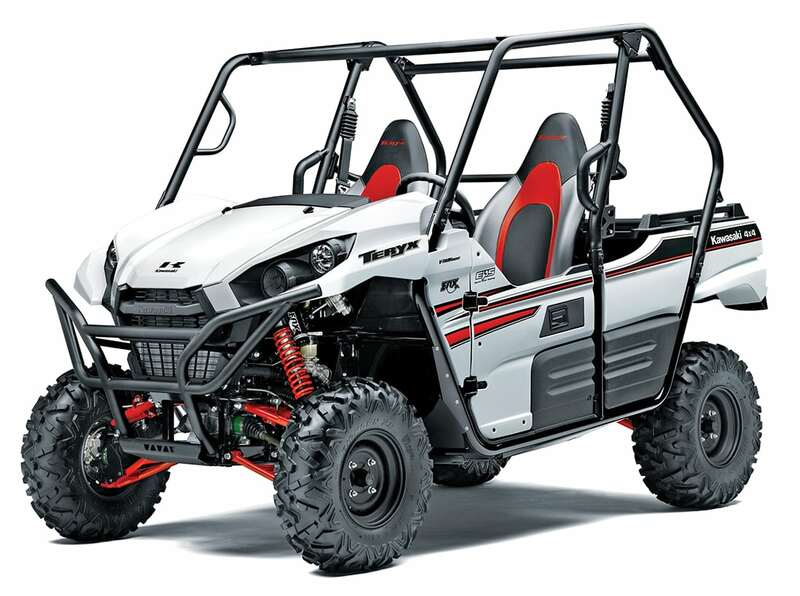 The 71-HP 800R returns in Bright White, and Commanders have the exclusive dual-level locking bed and dual torsion bars to fight body roll. Wheelbase is 75.8 inches, and twin-tube HPG shocks work with dual front A-arms and torsional-trailing arm to yield 10 inches of travel. XTs add a 4,500-pound winch, H-D bumper, bed rails and mudguard fender extensions. A rear-mounted V-twin delivers 50 HP and 50 pound-foot of torque to the Pro-Torq CVT with QRS and belt protection. The rear diff unlocks for turf-saving mode, while the Visco-Lok front diff locks automatically. Wheelbase is 83 inches, and the 62-inch width and rear torsion bar aid cornering. The DPS version has EPS with three selectable levels of assist and four color choices. XTs upgrade to a 4,500-pound winch, front bumper, full skid plate, hard roof and reinforced XT seat skin for the Versa-Pro bench seat. The XT Cab adds full-cab enclosure with glass windshield, wiper/washers, doors with electric window, sliding rear window and heater. A rear-mounted V-twin delivers 50-HP and 50 pound-foot of torque to the Pro-Torq CVT with QRS and EBS. CFMoto’s UForce 800cc V-twin makes 62.5 HP and 53 pound-foot of torque with 10.3:1 compression, and the CVT is a high-performance CVTech with EBS. Wheelbase is 72 inches. UForces have a 3,500-pound winch, LED projector headlights, 14-inch alloy wheels, 2-inch receiver and large dump bed with nitrogen gas-assist lift. Claimed dry weight 1,377 lb. The 783cc V-twin has 85mm pistons, 69mm stroke, 10.7:1 compression and two 36mm Mikuni throttle bodies, and the CVT has a centrifugal clutch for long belt life. Redesigned front styling is more aggressive, and Fox Podium 2.0 shocks are plush with 24-position compression-damping adjustment. 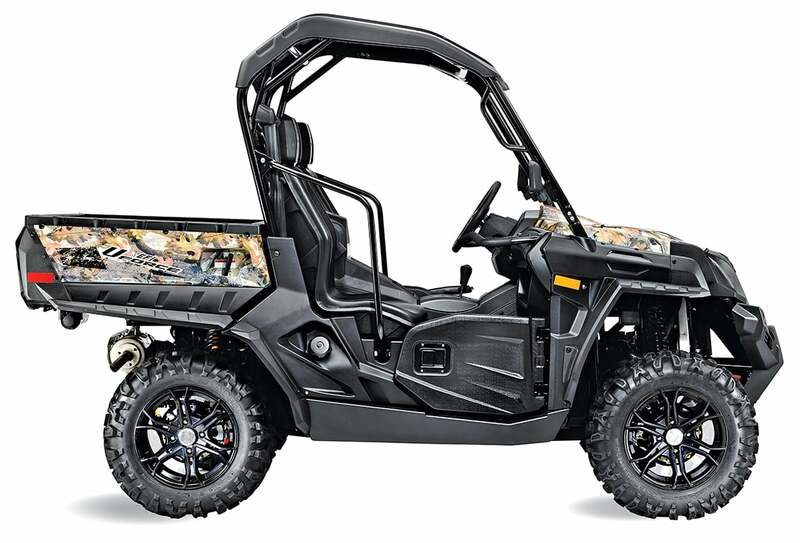 The Camo Teryx has a roof and four LED headlights. Claimed curb weight 1,571.5 lb., Camo 1,582.5 lb. The 783cc V-twin makes 47 pound-foot of torque at 5,500 rpm, and the CVT has a centrifugal clutch for longer belt life. Redesigned front styling is more aggressive, and the Fox Podium 2.0 shocks are plush and feature 24-position compression-damping adjustment. 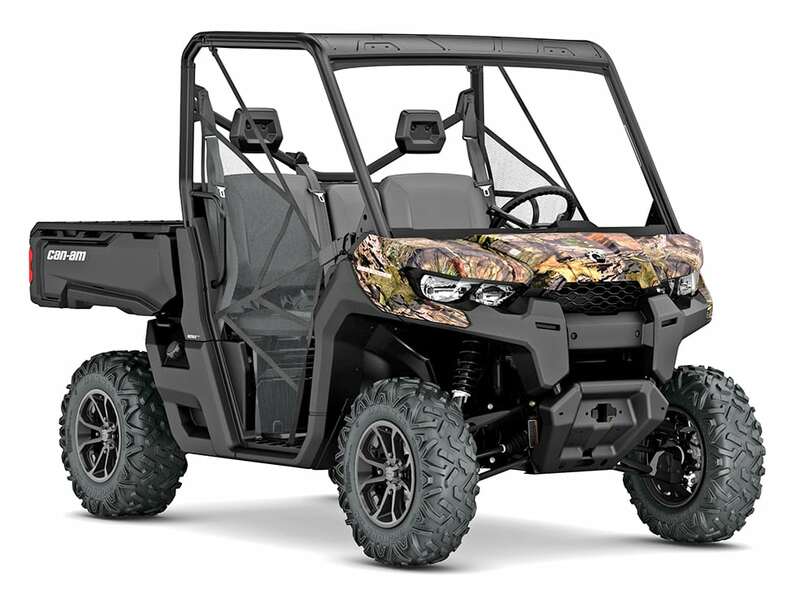 Limited Editions have a new digital camo choice, roof, four LED lights and trick aluminum rims with 27-inch Bighorns on two-tone 14-inch rims. Claimed curb weight 1,589.1 lb. The Sector 750 displaces 735cc via a 102mm piston and 90mm stroke with Delphi EFI induction and a locking front diff. 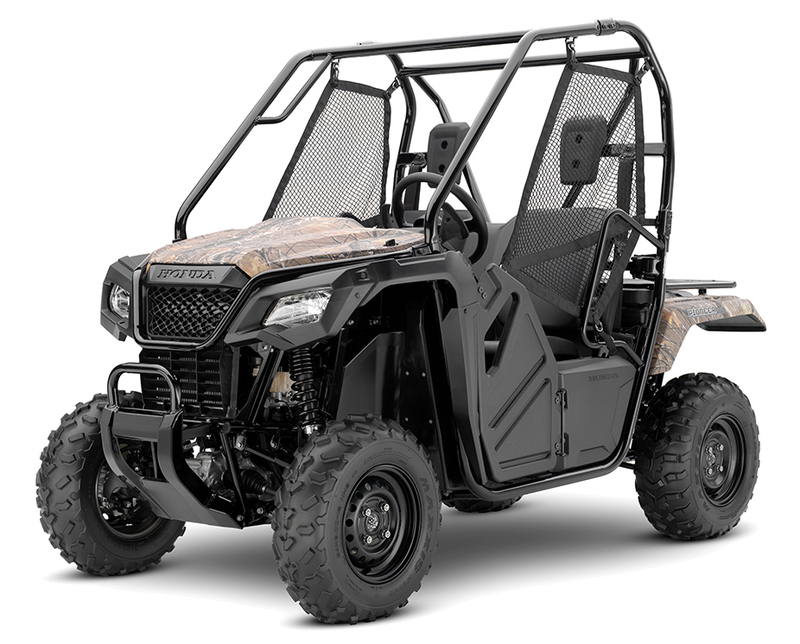 Sectors sport a hard roof, split windshield, 3,500-pound winch, H-D bumper, LED lights, side mirrors, and a power dump-bed. Wheelbase is 75.6 inches, and they’re CARB/EPA-legal. 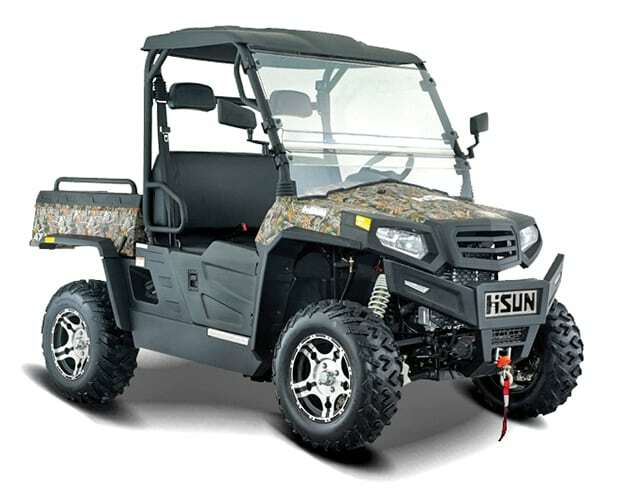 Hisun also covers Sectors with a two-year warranty. 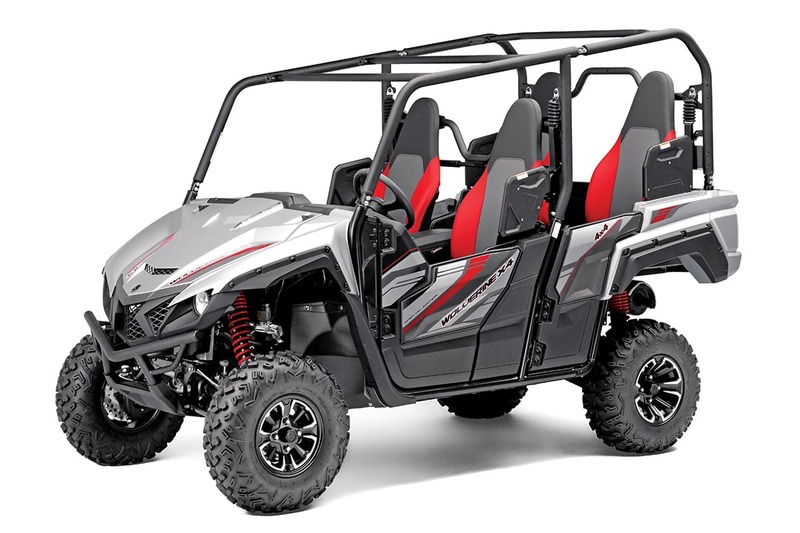 Pioneer 700s have a 675cc single inline engine with 102mm piston, 82.6mm stroke, mild 9.2:1 compression, and a 40mm EFI throttle body powering an automatic three-speed transmission and torque converter. In 2017, the 700 got a new front bumper, fascia and graphics. The Deluxe adds EPS, auto- and manual-transmission mode, and paddle shifters. New, UXVs get a styling update including a pick-up-style hood, three-way adjustable Kaifi gas shocks, high-clearance A-arms, new cage, improved CVT, bucket seats and new seat belts, sport steering wheel and improved parking brake lever. 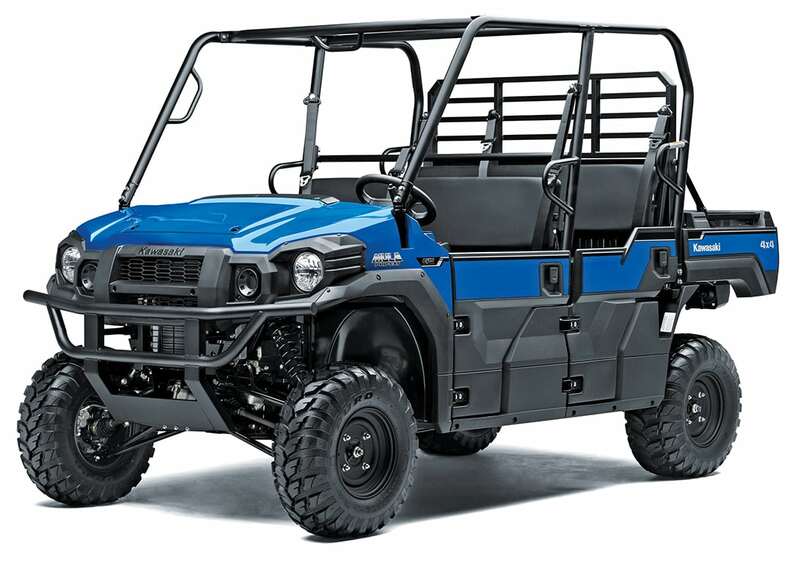 The UXV 700i has a 695cc, 45-HP EFI single; Limited Editions have EPS, alloy wheels with 26-inch tires, and 3,000-pound NuJet winch. Claimed dry weight 1,137 lb., LE 1,218 lb. 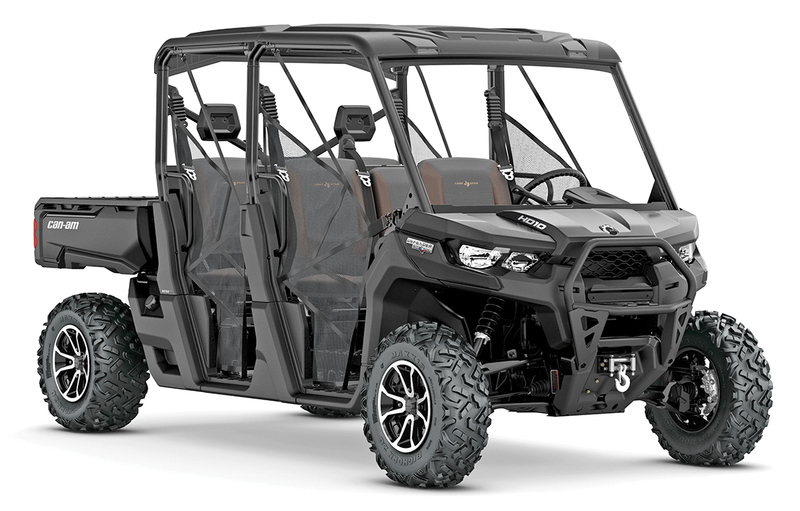 The LE Prime gets all UXV 700i and LE upgrades, plus a hard top, front and rear windshields and tubular bed extender, while the LE Hunter gets all of that, plus a gun boot and mount. 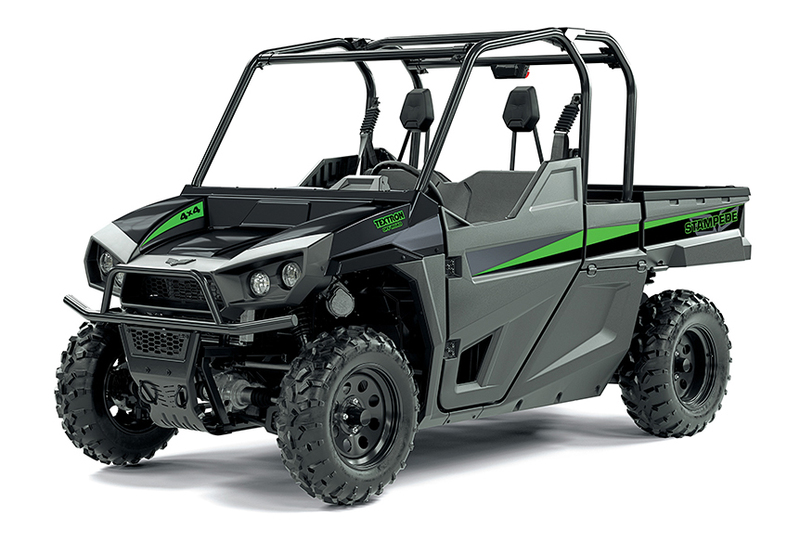 All UXV 700is are powered by a 45-HP 695cc single with a 102mm piston, 85mm stroke and EFI induction that makes 39.75 pound-foot of torque at 5,500 rpm and a new CVT with Park mode. 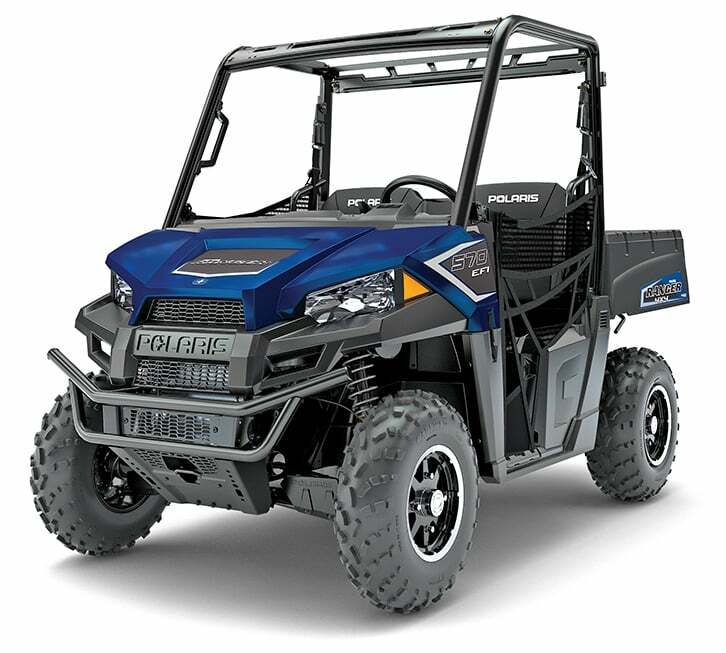 Vikings sport the old 686cc Rhino engine in a wider frame with three-person seating and crop-row width. Although designed for work with a one-year air-filtration service schedule, Vikings do 50-plus mph and have a hard top. EPS is an extra $1000, and the new Special Edition sports Midnight Blue paint, under-seat storage, aluminum rims and over-fenders. 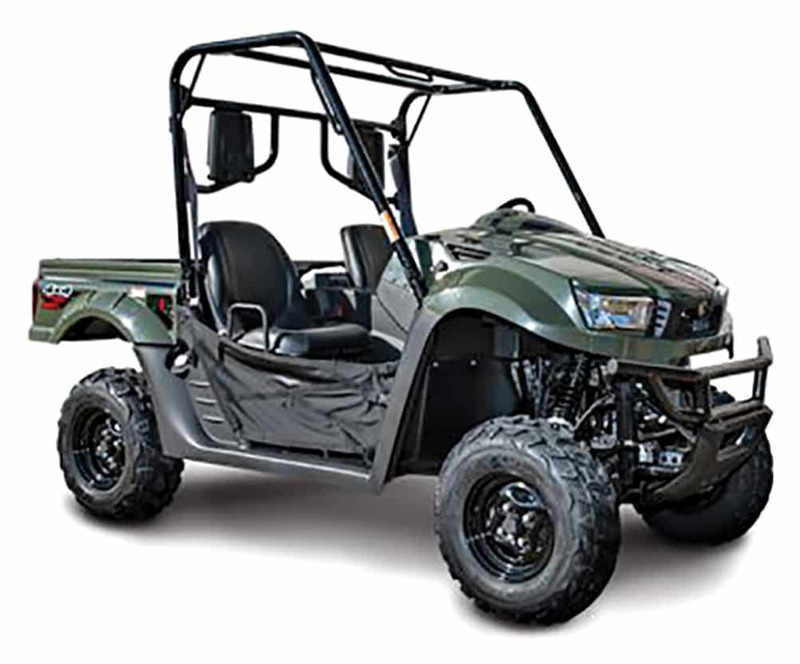 Vikings sport a 84.1-inch wheelbase and 8.1 inches of suspension travel with preload-adjustable HPG shocks. The new Special Edition sports Midnight Blue paint, under-seat storage, cast aluminum rims and over-fenders. New, the Ranch Edition Viking sports Special Edition additions, plus Metallic Sand paint, blacked-out aluminum wheels and a rear-view mirror. Textron’s 443cc liquid-cooled single has a 89mm piston and 71.2mm stroke with EFI and a Duramatic CVT transmission. 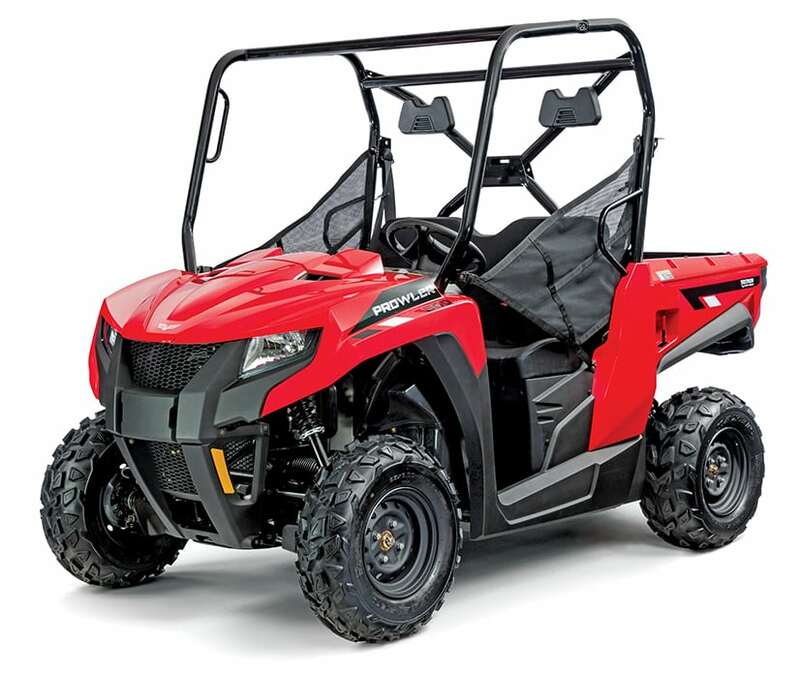 Surlyn body panels have aggressive styling with a sloping pick-up-like hood, halogen headlights, under-hood storage, tilt wheel, stylish dash-center instruments, 12V-DC outlet and controls, and tilt bed with 500-pound capacity. Claimed dry weight 1,288 lb. The 500i UXV now only comes in one version and in three colors. The 500i has a 92mm piston, 75mm stroke and EFI induction producing 36 HP and 28.2 pound-foot of torque at 5,500 rpm. The dual-range CVT has improved clutching, and it has a locking front diff; storage includes under-seat, dry under-hood and a locking glove box. Claimed dry weight 1,212 lb. LE 1,218 lb., G 1,226 lb. 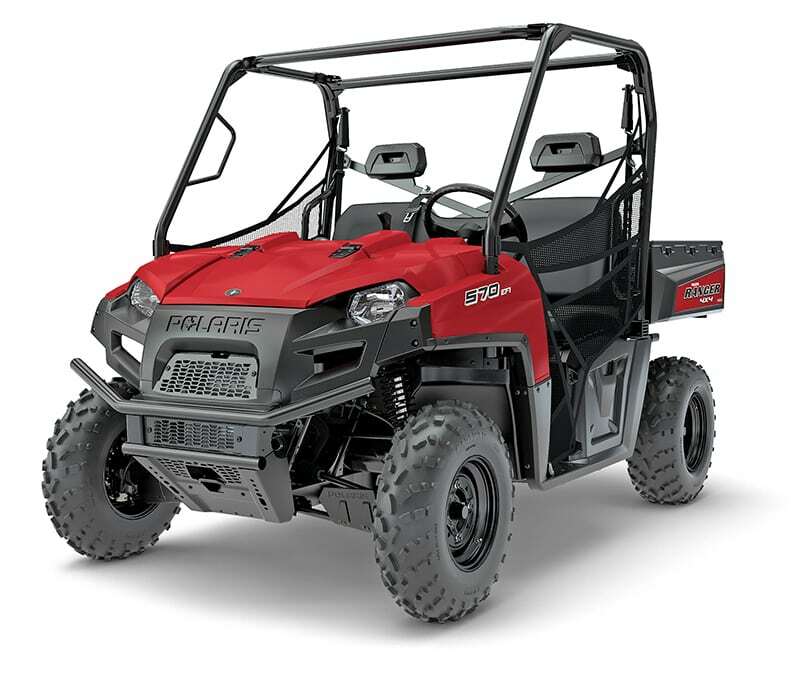 The 29-HP Pioneer 500 has a five-speed electronic-shift transmission with auto clutch and reverse, with a toggle to choose full-auto or manual-shift modes and paddle shifters. The 50-inch UTV is USFS-trail-legal and a blast to drive, and the 475cc single has a 92mm piston, 71.5mm stroke, 9.5:1 compression and 36mm EFI throttle body. Dual-rate shock springs improve the ride. 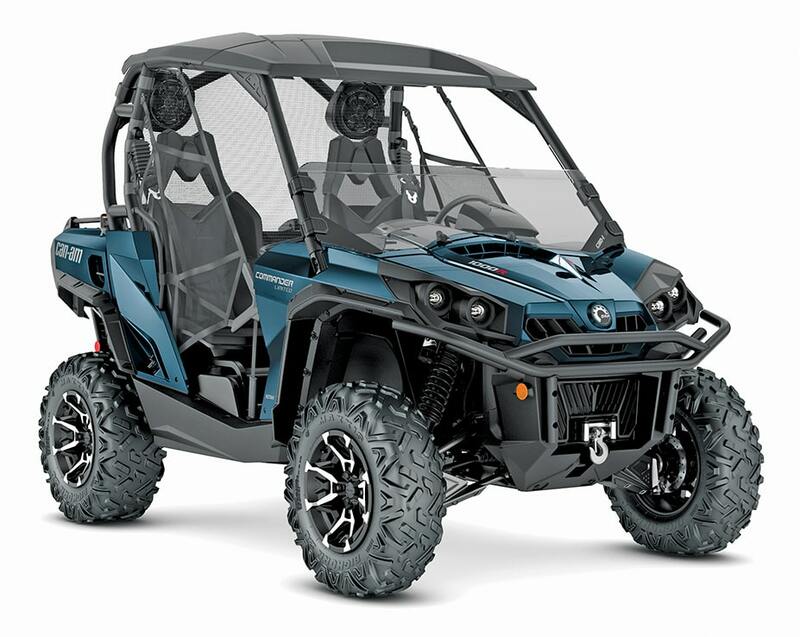 Commanders have an 85-HP V-twin, CVT with EBS, Visco-Lok QE diff, EPS, 106-inch WB, dual torsion bars, dual-level tilt bed, and HPG shocks with 10 inches of travel. There is also a Max 800 in green for $14,299. XTs upgrade to a H-D front bumper, bed rails, mudguards, and 4,500-pound winch. 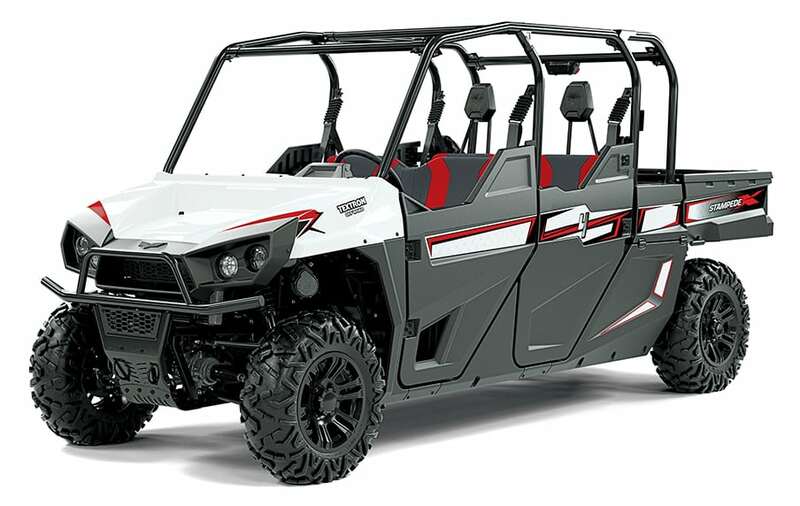 Limiteds get XT gear plus Bluetooth sound system, Garmin Montana 650t GPS, roof and paint. The 976cc V-twin makes 72 HP and has three drive modes plus an unlocking rear diff for four drive modes. 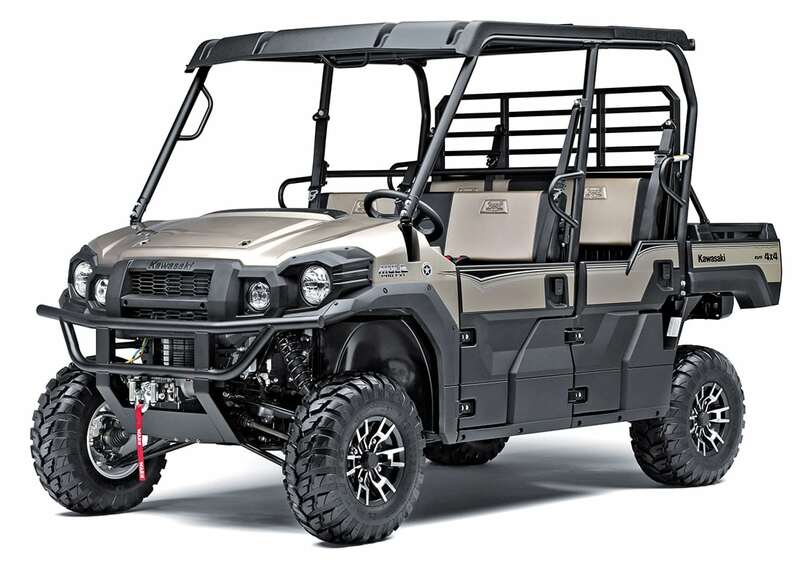 The Lone Star Edition salutes Texas and sports high-clearance arched front and rear A-arms, torsion bar, dual two-tone seats with Lone Star trim and badges, full hard roof, front bumper, 28-inch Bighorn 2.0 tires on two-tone rims and a 4,500-pound winch. Sectors sport a 976cc V-twin with 91mm pistons, 75mm stroke and 11.0:1 compression with Delphi EFI and CVTech Trailbloc IBC CVT. 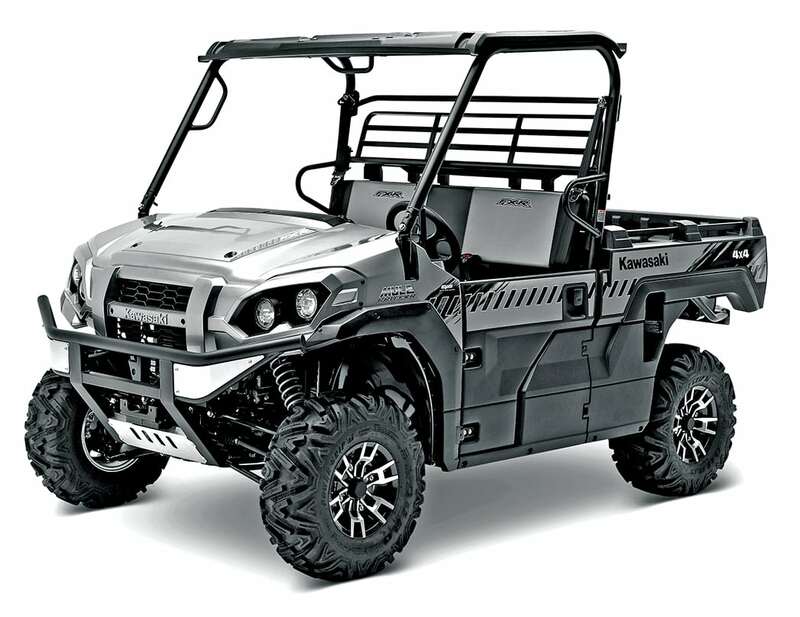 The four-seat Sector Crew sports a roof, split windshield, 4,500-pound winch, H-D bumper, LED lights, side mirrors, turn signals and a power dump bed. Wheelbase is 117 inches, and the Crew is CARB/EPA-legal. Claimed dry weight 1,881 lb. 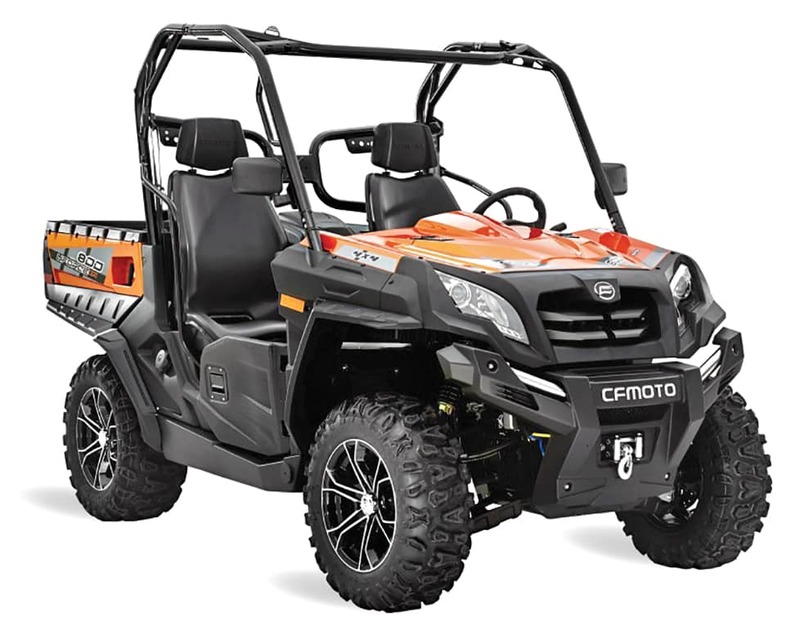 The Pioneer 1000-5 sports an industry-leading 80.2-inch WB, a 999cc inline twin with a 6-speed transmission, paddle shifters and automatic Dual-Clutch Transmission, plus convertible rear seats that keep the bed from tilting when up. 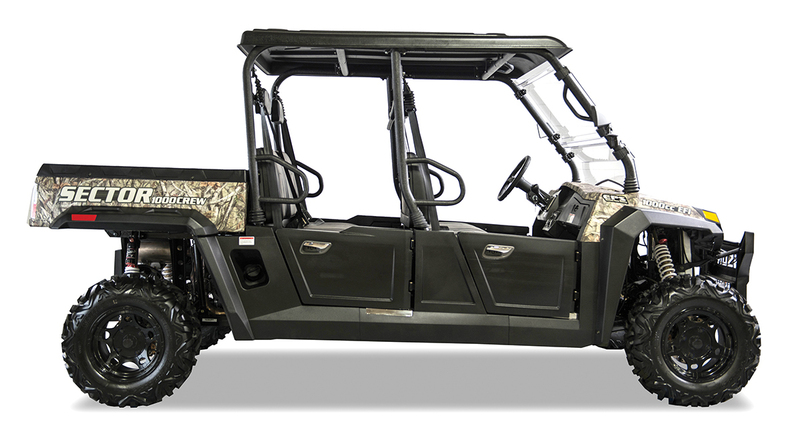 Deluxe adds LED lights, 14-inch aluminum rims, and HPC Camo option. Limiteds get I-4WD, Fox QS3 shocks, Hill-Start Assist and Electronic Brakeforce. New in 2017, the 80-HP ProStar EFI twin makes 61 pound-foot of torque with a Versa-Trak unlocking rear diff, EBS and On-Demand AWD front diff. The Crew seats six adults and has an 113-inch wheelbase and 11.3 inches of ground clearance. Front and rear hydraulic brakes have dual-piston calipers, plus the CVT has a handy Park mode. All Rangers have tilt steering. The High Lifter Edition doesn’t have the unlocking rear diff, and it adds a Pro Lock front diff to turn 28-inch Outlaw 2 mud tires. Travel is shorter (8.0/8.5 inches), and shock springs are stiffer to offset mud buildup. 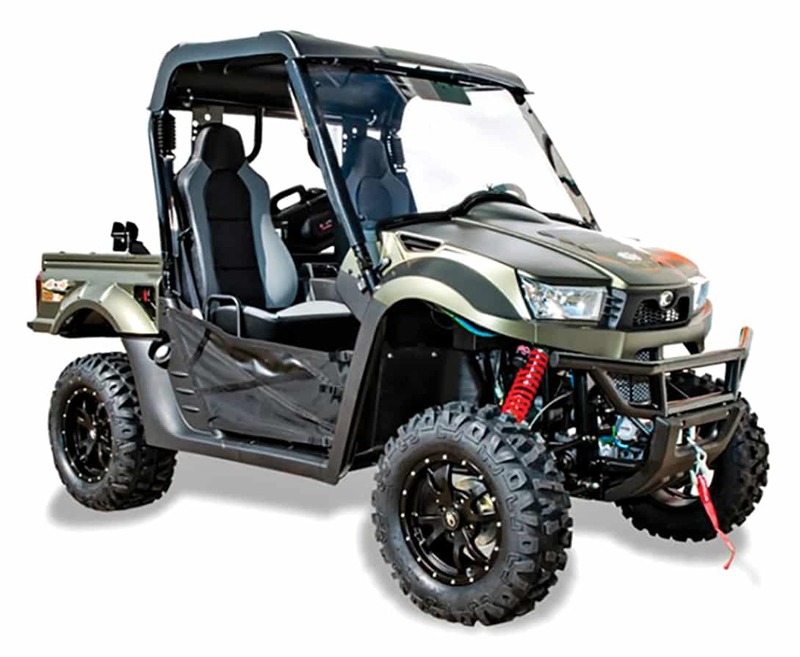 High Lifters also sport high-clearance lower A-arms, heavy-duty front bumper, a 4,500-pound winch, headrest-level snorkels and a rear-view mirror. Carry six occupants in style with a fully enclosed poly cabin and dash vents for the HVAC air-conditioning and heater unit. A glass windshield with wiper, glass rear window, sliding front-door windows, and 26-inch PXT tires on Black Xcelerator wheels are also standard. It’s powered by a ProStar 999cc inline twin that makes 80 HP and 61 pound-foot of torque. 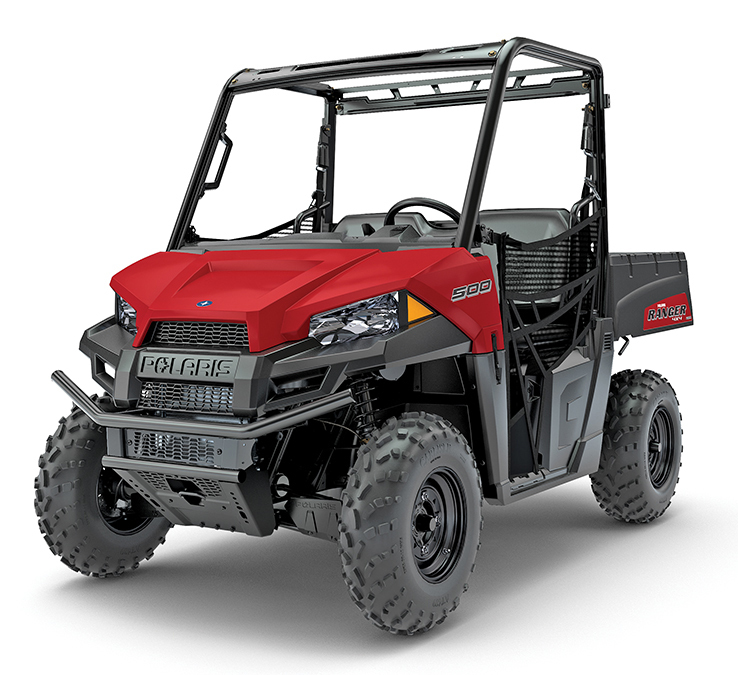 Where Pro-FX Mules seat three, the Pro-FXT transforms from seating for six to three with a tilt bed that will hold a pallet-sized load of 1000 pounds. 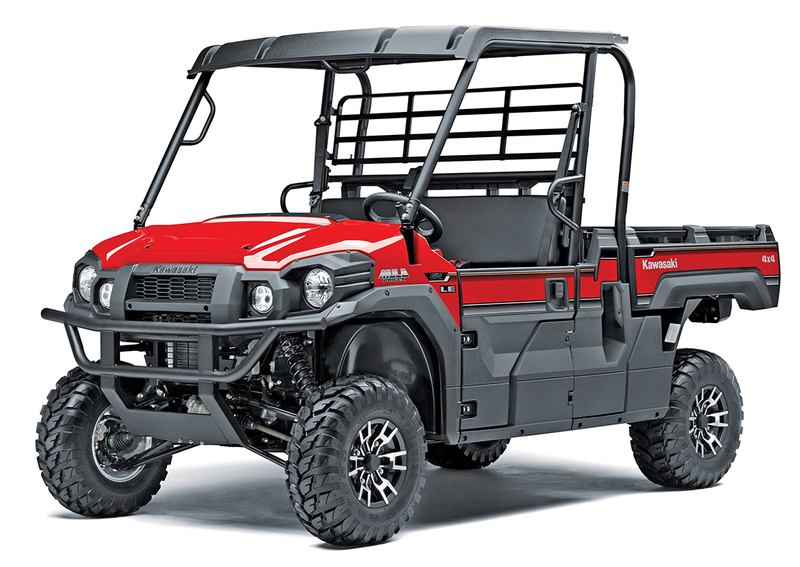 All Pro-series Mules will tow a ton with 48 pound-foot of torque at 3,500 rpm. Long, stout A-arms and HPG shocks deliver 8.7 inches of travel. Drive shafts have CVs, and the two headlights are Halogen. EPS has speed-sensitive assist. Claimed curb weight 1,887.5 lb. 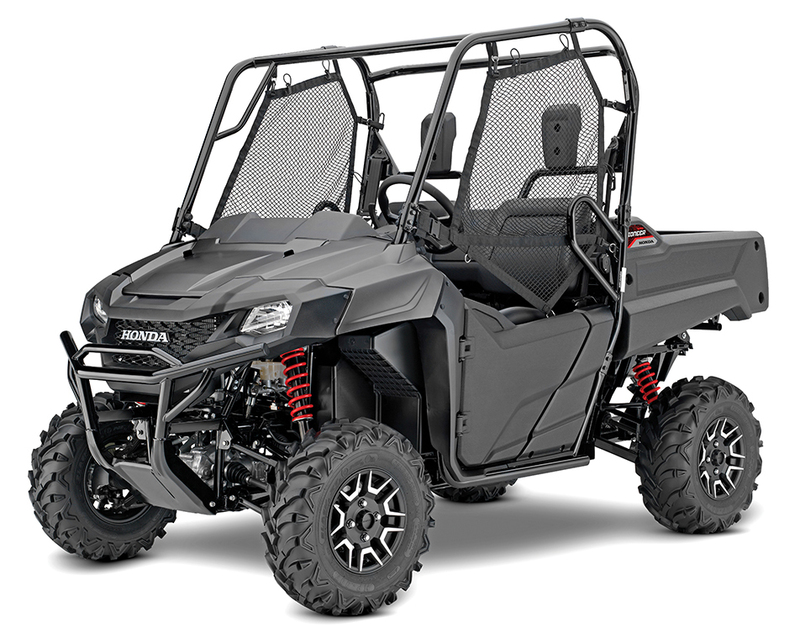 New, the Wolverine X-4 sports Yamaha’s first twin-cylinder UTV engine with 82mm pistons, offset cylinders, 80.2mm stroke with short rods, dry-sump for low CG and mid-engine design for centralized mass. Full-sized stadium seats stow forward for up to 600 pounds of cargo, and rear shocks are self-leveling for various loads. Claimed curb weight 1,663 lb. ; SE, 1,666 lb.